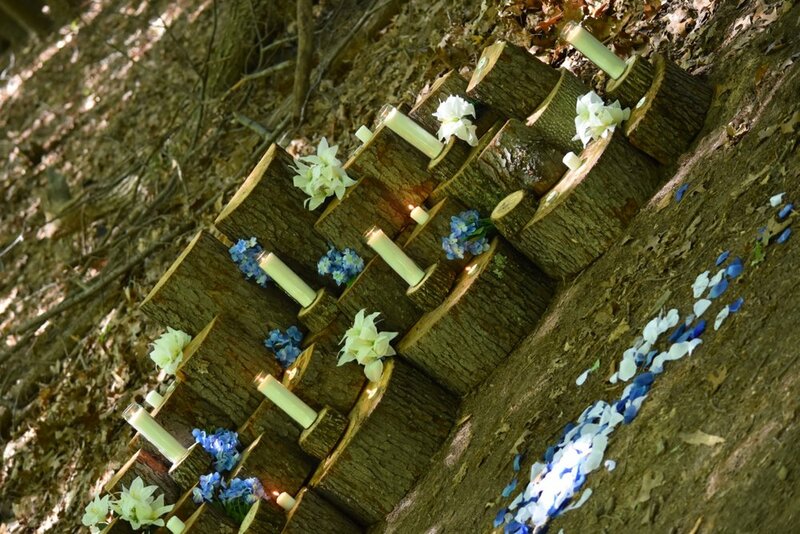 Outdoor weddings require extra planning and North Bend State Park is here to help! Take a look and familiarize yourself with their facility and options and when you’re ready, Kristi is available to answer all your questions and more at 304.643.2931, ext. 304 or northbendsp@wv.gov. North Bend Restaurant operates the concession at North Bend State Park and they are available to cater your special day. Plan a beautiful wedding reception meal to fit any taste and budget. They can even cater your rehearsal dinner, bridal luncheon and farewell breakfast! North Bend offers a 29-room lodge, 9 deluxe cabins and a variety of campsites. Rooms and cabins can be blocked off for your guests and have a two-night minimum stay on weekends. From the second Monday in June until the second Monday in August, cabins must be rented by the week on a Monday-to-Monday basis. Reservations for park facilities may be made at 8 a.m. the first day of the month you wish to book, two years in advance. Reservations for 15 or more rooms may be made three years in advance. North Bend State Park has beautiful outdoor sites from which to pick for your wedding including three shelters and an amphitheater. 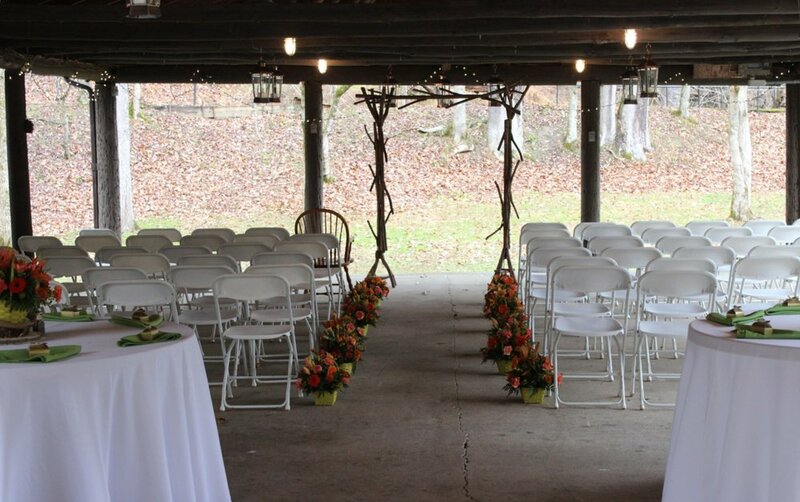 Turner Gazebo, along the North Bend Rail Trail, is also available for your outdoor ceremony. Picnic tables under the shelter may be removed and replaced for an additional $50 fee. If tables are removed by the wedding party and not replaced, the fee will be charged. With catering of $1,000 or more the shelter fee is waived for that day. All rates are subject to a 6 % sales tax. All rates subject to change. Accommodates up to 75 people. The Hardley Able Carriage Company is happy to provide transportation for the bridal party or guests anywhere in the park. You may even decorate the carriage to match your weddings color scheme. A special rate may be arranged by contacting John Smith at 304.869.3051. Rental items dropped off at chosen location for placement by wedding party. Rates are per day. Due to high cost of set up, no refunds given without 14 days prior notice. All prices subject to 6 % sales tax. North Bend State Park does not provide changing areas for the bridal party. Rooms and cabins may be rented for this purpose. The State Park is open to the public from 8 a.m. - 10 p.m. All non-registered guests will be asked to leave the park at 10 p.m.
Be sure to allow clean up time prior to 10 p.m. There is a fee for picnic tables not returned to the shelter. If you are considering a wedding at Turner Gazebo, please remember NO motorized vehicles permitted on North Bend Rail Trail. There is not parking on game courts. Parking areas and park roads cannot be blocked to the public. When you reserve a shelter, you are reserving just the shelter. Lawn areas are open to the public. Consumption of alcoholic beverages in public areas are forbidden by state law. Confine such beverages to the shelter. No refunds due to inclement weather. Be sure to make rain plans.